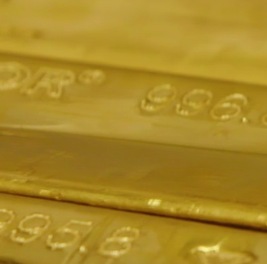 Will Central Bank Gold-Buying Drive 2019 Prices? THREE great entries last week in 'Questions to which the answer is no', writes Adrian Ash at BullionVault. "Can the world," asked Bloomberg, "escape the low rates trap Japan is stuck in?" "Are Russia, China & Turkey," asked RT.com "bringing back the gold standard?" And "Could central bank buying," asked a blog at MarketRealist, "be a major driver for gold in 2019?" Tossing the second question straight into the wastebin where it belongs, the first question matters much more for gold prices than No.3 does. Yes, central-bank action in gold did sometimes help drive the metal's price in the past. Most notably that was downwards during the heavy sales of the 1990s...then plunging on the stark stupidity of Britain's sales in 1999...and then spiking when the other Western central banks agreed to announce and cap their sales clearly in advance, helping the metal find a floor at last. Yes, that selling flipped around to central-bank buying in 2009...helping drive the metal further up out of the financial crisis towards its (current) all-time peak of 2011. But central banks...as a group...have already remained net buyers each year since then. As you can see, their year-on-year the change in central-bank gold demand (or selling) doesn't map the change in gold prices anyway (just check the post-2012 outcomes for instance). And now 2019 starts with central-bank buying both heavy and long-running already. 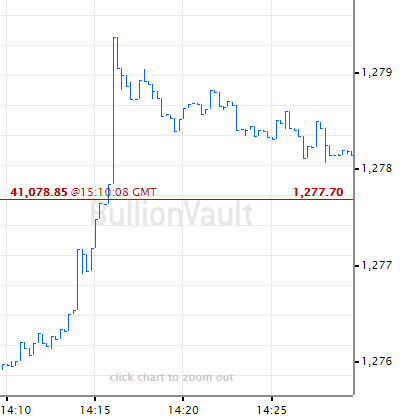 ...and like official intervention in the currency market, central-bank gold action needs to surprise everyone else (either by timing or size) to drive prices up or down. More crucially it also needs to be plainly out in the open, clearly stated in public. But this is gold we're talking about...which is something central bankers hate talking about! All told, any surprise in central-bank gold looks limited in 2019 to the Central Bank Gold Agreement. First signed by Western central banks back in 1999 (forcing them to mention the "G" word to counter the idiocy of UK finance minister Gordon Brown's ham-fisted sales) it has been extended 3 times since, each running for 5 years. 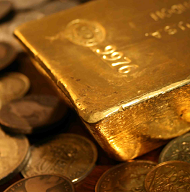 The CBGA sets a limit on gold sales for each signatory and also across the group as a whole. 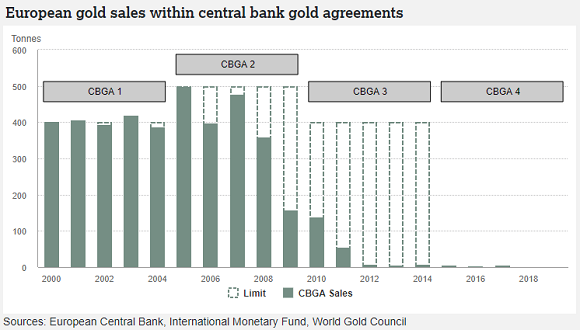 But where CBGA1 and CBGA2 saw the signatories sell almost 2,000 tonnes in each of those 5-year periods, CBGA3 coincided with the global financial crisis...squashing gold sales by European states down towards zero...and CBGA4 has seen pretty much zero selling since it was signed in May 2014. 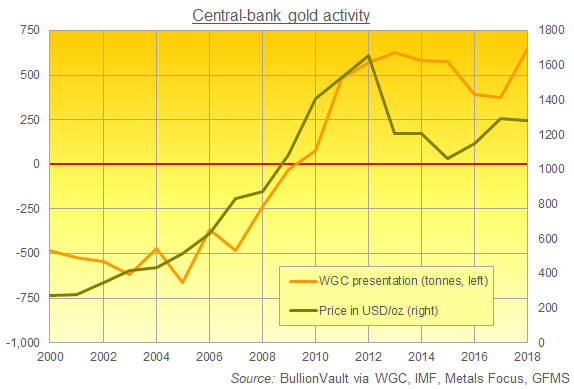 Will Western Europe's big legacy gold holders bother signing a new CBGA before No.4 expires this September? ...not unless things are really, really bad like in Gaddafi's dying days or in Venezuela today. Even the clowns now trying to run Italy know that selling gold during a crisis would only signal just how bad things have become, tipping Rome into the ultimate crisis it avoided back in 1976 by taking a loan in exchange for gold collateral, rather than selling the stuff outright. But will that stop Germany, France, Italy and the rest signing CBGA5 regardless? And will it matter anyway? Certainly we can file that last one under 'Questions to which the answer is no'. Because on the other side, emerging markets continue to hoard gold like it's going out of fashion. And that's what drives headline writers to imagine that central-bank action might impact prices. Just this week the People's Bank of China said it added a bit more in January. And hey, prices rose last month, right?! But even as Turkey and Russia also thumb their noses at the United States too – buying gold from Venezuela and straight from the pit-head respectively to build their FX reserves outside of Washington's Dollar clearing system – the real mover of gold prices last month was another kind of central-bank action entirely. Because after the stock market sank 10% in December, it was the turnaround in US Fed policy on interest rates which really matters. And now the debate has moved onto restarting QE too. "In the financial crisis, when we were trying to help the economy, we engaged in these quantitative easing policies," noted San Francisco Federal Reserve Bank President Mary Daly on Friday. "An important question is, should those always be in the tool kit...should you always have [QE] at the ready...or should you think about those tools only when you really hit the zero lower bound and you have no other things you can do. 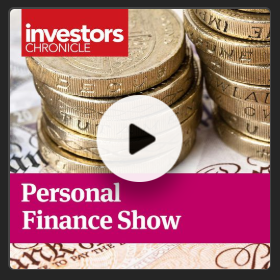 "You could imagine executing policy with your interest rate as your primary tool and the balance sheet as a secondary tool, but one that you would use more readily. That's not decided yet, but it's part of what we are discussing now." This 'discussion' will get more airtime as 2019 unfolds. Much more, especially against the sudden interest in Modern Monetary Theory spurred by bright young US politician Alexandria Ocasio-Cortez (or 'AOC' to headline writers). She likes how MMT basically says the government can print and spend an economy into a never-ending boom. I mean, who wouldn't? If it were true. "Ten years ago, faced with mass bankruptcies and the very real prospect of a rerun of the Great Depression, the US Federal Reserve took the fateful decision to unveil a new policy called 'quantitative easing'," writes economist David McWilliams. "Supposed to protect the balance sheets of the wealthy [it] unleashed forces that may lead to the appropriation of those assets in the coming years [because] the policy saved the rich and screwed the young." ...a concept already long discussed by academics and known as ' helicopter money'. ...even using the phrase " ongoing economic expansion" with a straight face while also winking at the idea of extending the bottomless pit of cheap ECB loans known as LTRO. "Helicopter Money is (almost) inevitable. The only questions are: who does it; and when do they do it..."
Next to those questions, the issue of a rise or fall in central-bank gold demand looks entirely irrelevant to prices.